Most people had stayed up for the week after the Plockton meet over Easter taking advantage of the extra Royal Wedding holiday on the Friday before the May holiday. It was a band of happy campers who arrived at Gairloch after several days of great weather. The Fisherfield 6 had been done by the Fisherfield 4 + 2 with some corbetts thrown in for good measure. Kenny, Anne and I had taken the boat to Loch Coruisk and enjoyed a perfect Skye day on the Dubhs ridge. Martin did yet another traverse of Clach Glas Bla Bheinn followed the next day by coming round the back of the middle section of the ridge to further cement his Skye guru status. 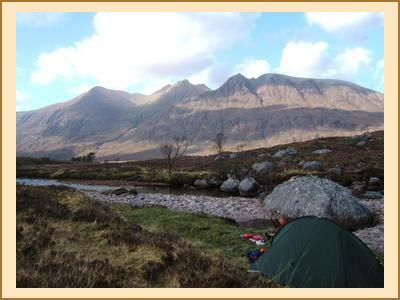 Alan and Fiona completed a lengthy Knoydart backpack which involved a considerable amount of up and down. On Friday, the Fisherfield 4 decided to have a brief rest with a coastal walk at Redpoint and some otter watching. Fiona M was looking to do some roadside cragging after the Knoydart leg killer but a lack of willing volunteers meant she was persuaded to join Kenny and me for the 4 hour approach to Ecstasy- the most remote severe climb in the country. A useful recce for later in the weekend. Martin and Alan warmed down by combining the obvious pair of A Mhaighdean and Beinn Lair while Nigel and Fiona enjoyed a weird moon landscape on the summit of Beinn a Chearcaill. On Sat night the wind had dropped and the forecast for Sunday was very good. Fiona, Chris and I took our opportunity to head for Fionn Buttress with a very early start leaving Poolewe around 715. The route was 11 pitches which Fiona predicted would be dispatched in 6 hours provided that we were “efficient and did not mess about”. Taking the bikes in a little further than for Ecstasy backfired when I quickly got a puncture from the drainage ditches and had to walk my bike to where Chris and Fiona were waiting. 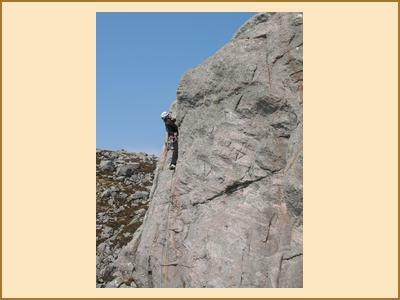 One pitch into Fionn Buttress and time estimates were being hastily revised. Two pitches later after a little route finding difficulty on the third pitch one member of the group was starting to regret leaving her head torch at the bikes. Fortunately, we began to make sense of the route and got into our groove topping out after 6 ¾ hours. A long walk and cycle out into the sunset and two puncture repairs later, we were finally all back at Poolewe around 9pm. A memorable and exciting day. Mark, Ian, Kate and Alan had excellent views on Beinn Eighe with Mark getting a further two new munros to add to the week’s tally. Kenny, Martin and Nigel also did Beinn Eighe via the climb, Ordinary route.. Kenny then put in a strong bid for man of the year award by hurrying his main course, missing dessert to come and pick me up at Poolewe and then cooking my tea for me. .
Monday was another glorious day but nobody was moving too quickly after the exertions of Sunday. Nigel continued his Northwest Graham hunt with Meall Mheinnidh. Kate, Mark, Ian and Alan headed for coffee shops on the way home. Kenny and Martin did the little hill, An Groban above Gairloch and put the world to rights along the way. Fiona and I had a most relaxing day cragging at Aztec Tower followed by coffee at the mountain shop and for Kenny and me paddling at Gruinard beach.. Wonderful stuff.